It’s scientifically documented, but surprisingly seldom discussed, the positive benefits of Saliva in the constant battle to lose weight indicating that Thin Women Eat Slowly. But there is another far more powerful benefit in keeping the food in your mouth, which is even more important to those wishing to find the ‘secret’ to permanent weight loss, as detailed in this article in the Daily Mail. A vital part of the digestion process of food starts in the mouth. Saliva contains the enzyme Amylase, which can break down starch, additionally salivary Lipase in the mouth commences the breakdown of fats, but of course, only if you don’t swallow the food too quickly! standard Gastric Mind Band treatment, thinks most are. Slowing down his own eating was a major component of his amazing 65lb weight loss. So what can you do to slow down? Alan Sugar’s book advocates eating with a ‘Little Fork’, others suggest placing your knife and fork in the opposite hands. Some of the tricks taught at the Elite Clinic involve playing a secret game at meal times, ensuring you win by always being the last to finish. The clinic’s solution to achieving permanent weight loss with their clients involves the use of their own unique type of CBT – Pause Button Therapy. It instigates permanently changing the person’s thinking into that of a slim person, because slim people really do think differently around food. Visit the Gastric Mind Band Page to read more details of just how the treatment works. 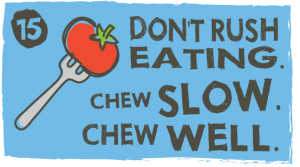 Healthy digestion and nutrient absorption begins with the simple act of chewing your food. When you chew your food properly, your body releases digestive enzymes in the stomach that help to break down food so that your body can convert it into energy. Read more about it here. So, keep the food in your mouth a little longer, enjoy every mouthful, there is no rush, no prizes for the first to finish, in fact, if you are trying to lose or maintain your weight, the prize may just come from you always finishing last. Of course there are other reasons that people gain weight, take a look at The Origins of Obesity on this site.